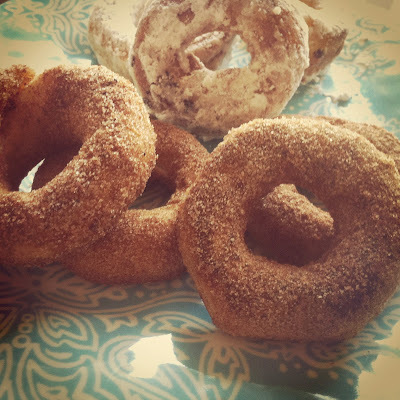 Allow me to introduce you to the easiest homemade donuts ever. I'm not even sure I'm allowed to call them "homemade" but anything I make at home, I consider homemade. From a box or not...all the same I say! In this case it's from a can. I shared this picture & recipe on my instagram the first time I made them and apparently some of you have made these many a time in your day, or your mama did. I was not fortunate to learn about this until recently when I read about them on Autumn's blog. And now I am indebted to her for making my children the happiest people on earth every Saturday morning. These have replaced the requests for pancakes and even homemade waffles lately. Take a can of biscuits. Cut out the center of each one, using whatever you can find that would be the right size. For me it was a cap off of one of those squeeze cups for kids you see in the dollar spot at Target. Perfect size. Heat your oil on medium heat for about 5 minutes. Carefully drop your dough into the oil and cook on each side for about 10 seconds. I covered some in cinnamon sugar, and some in powdered sugar. The kids and Brandon preferred the powdered sugar. I just rolled the doughnut around in a bowl of powdered sugar until it was fully coated. Do the same to the centers that you cut out for doughnut holes. And that is it my friends. Pretty much the easiest-slap yourself upside the head cause you never thought of it yourself- donut recipe on the planet. And one more "tip" I thought I'd share. I have been making rice crispy treats for YEARS. No lie. I'm a bit of an addict. And I've always followed the recipe exactly: 3 tablespoons of butter, 1 package of marshmallows and 6 cups of rice crispies. But my friend Monica recently told me she uses an entire stick of butter in hers and it makes them even better. I decided to test her theory when I made them this week and let me tell you...she was right. The extra butter makes them melt in your mouth delicious. Just the right amount of chewy to crispy ratio. Obviously not the healthiest of suggestions, but I'm a believer in splurging now and then, so I say go for it. Now who else out there has some tricks like this up their sleeve? 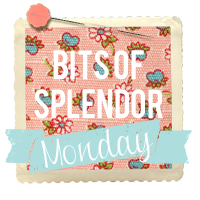 What bit of splendor did you find in your week? link up your post and share with us! Be sure to visit other blogs too! "You will miss what matters most in life, if you are only ever looking for the spectacular"
When I make rice crispies I add a smidge less cereal and a couple extra marshmallows with the amount of butter called for and it's perfection. donuts and rice krispy treats all on one post?! i'm drooling already. I made those yesterday. Sooooo good! I think they will be a regular around here. new to this linky, hope what i posted was ok! I'm going to make those donuts this weekend! They're so simple that I'm just sitting here dumbfounded as to how I haven't heard of them before! 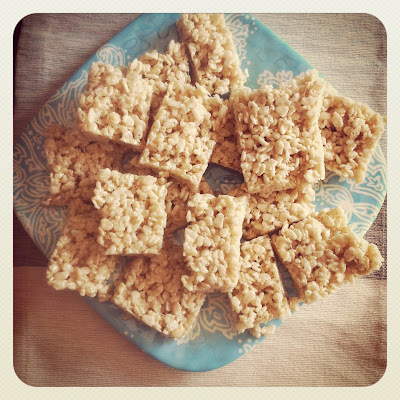 For some reason I've never been a fan of Rice Krispie Treats though. I love the cereal, but not the bars. Weird. Oh, duh, it just occurred to me why I don't like them...I'm not big on marshmallows! Shaking my head at how slow I am. Looks totally delish!!! And I was JUST thinking today about how I totally want to make homemade doughnuts. Yum yum. Those homemade donuts were always a hit in our household growing up. However, since I've gotten married - I haven't tried this easy recipe for my husband. I'm sure they'll be a hit. This Saturday, I now know what'll be on the menu. my mom used to make these ALL the time but i don't think i've ever made them myself. but i think i will be very soon. the only thing she did different was make a glaze out of powdered sugar and milk. so good!! i will definitely be trying the powdered sugar version you tried. mmm!! Oh my goodness, I did NOT need to know that about the Rice Krispie treats. Yum! I linked up to your link party. Your newest follower! Those donuts look delicious, and much easier to make than I expected!!! Look delicious! Seems pretty simple! Oh my! I did not know the biscuit donut tip! I just so happen to have a can of biscuits in my fridge...hmmm....tomorrow morning maybe?? You may need to add a disclaimer that your very unhealthy (read fat) friend Monica shared that tip ;) But seriously, aren't they amazing?? I'm trying s'mores treats tomorrow with golden Graham's and chopped up Hershey's! looks so yummy! If I had other people to share it with, i totally would make it.